This article is about the chemical element. Sulfur or sulphur (see spelling below) (chemical symbol S, atomic number 16) is a yellow crystalline solid at ordinary temperatures and pressures. It is tasteless and odorless and is classified as a nonmetal. It forms stable compounds with all elements except the noble gases. Abundant in nature, it can be found as the pure element or as sulfide and sulfate minerals. Many of the unpleasant odors of organic matter, including garlic odor and "skunk stink," are produced by sulfur-containing compounds. This element is essential for living organisms, particularly as part of the structures of certain amino acids and proteins. Moreover, sulfur and its compounds are important for a host of practical applications. Its derivative, sulfuric acid, ranks among the most important industrial raw materials. In addition, sulfur is used in producing batteries, detergents, fungicides, and fertilizers, and for the vulcanization of rubber. As a flammable material, sulfur is used in making matches, gunpowder, and fireworks. Several of the compounds of sulfur should be handled with care. For instance, hydrogen sulfide is quite toxic, and both sulfurous acid and sulfuric acid can harm biological tissue. The element has traditionally been spelled sulphur in several countries, such as the United Kingdom, Ireland, Hong Kong, and India, but it is spelled sulfur in the United States. Both spellings are used in Australia, Canada, and New Zealand. The International Union of Pure and Applied Chemists (IUPAC) adopted the spelling "sulfur" in 1990, as did the Royal Society of Chemistry Nomenclature Committee in 1992. Sulfur crystalites at Waiotapu hot springs, New Zealand. Elemental sulfur can be found near hot springs and volcanic regions in many parts of the world, especially along the Pacific "Ring of Fire"—a zone of frequent earthquakes and volcanic eruptions encircling the Pacific Ocean. Such volcanic deposits are currently exploited in Indonesia, Chile, and Japan. Significant deposits of elemental sulfur also exist in salt domes along the coast of the Gulf of Mexico and in evaporites in Eastern Europe and western Asia. (Evaporites are mineral sediments that are left behind after evaporation of the water in shich they were once dissolved) The sulfur in these deposits is believed to come from the action of anaerobic bacteria on sulfate minerals, especially gypsum. Such deposits form the basis for commercial production in the United States, Poland, Russia, Turkmenistan, and Ukraine. Sulfur extracted from oil, gas, and the Athabasca Oil Sands has led to a glut on the market, and huge stockpiles of sulfur can be seen throughout Alberta. metal sulfates, such as gypsum (calcium sulfate), alunite (potassium aluminum sulfate), and barite (barium sulfate). Sulfur is present in many types of meteorites. In addition, the distinctive colors of Jupiter's volcanic moon Io are thought to correspond to various forms of gaseous, molten, and solid sulfur. There is also a dark area near the lunar crater Aristarchus that may be a sulfur deposit. Sulfur (Sanskrit, sulvere; Latin sulpur) was known in ancient times, and is referred to in several books of the Bible, including the book of Genesis. It has been suggested that the word may have been derived from the Arabic sufra, meaning yellow, which is the color of the naturally occurring form of the element. In the eighth century B.C.E., Homer mentioned "pest-averting sulfur"; and in 424 B.C.E., the tribe of Boeotia destroyed the walls of a city by burning a mixture of coal, sulfur, and tar under them. Sometime in the twelfth century, the Chinese invented gunpowder, which is a mixture of potassium nitrate (KNO3), carbon, and sulfur. Early alchemists gave sulfur its own alchemical symbol—a triangle at the top of a cross. In the late 1770s, Antoine Lavoisier helped convince the scientific community that sulfur was an element, not a compound. Furniture makers of the late eighteenth century used molten sulfur to produce decorative inlays in their craft. That craft, however, was soon abandoned because of the sulfur dioxide produced during the process of melting sulfur. In 1867, sulfur was discovered in underground deposits in Louisiana and Texas. The overlying layer of earth was quicksand, prohibiting ordinary mining operations. Therefore, it was removed by the Frasch process—the underground sulfur was melted by pumping superheated steam through pipes set in the ground, and the molten sulfur was pumped out. In the Bible, sulfur is referred to as "brimstone." The book of Genesis, in particular, mentions that God punished evildoers in Sodom and Gomorrah by raining "brimstone and fire" upon them. Accordingly, a "fire and brimstone" sermon is one in which listeners are reminded of the fate of eternal damnation that awaits the unrepentant sinner. Also, hell is implied as having the smell of sulfur, although, as mentioned above, sulfur is odorless. The "smell of sulfur" usually refers to the odor of sulfur compounds such as hydrogen sulfide, which has the smell of rotten eggs. A piece of sulfur melts to a blood-red liquid. When burned, it emits a blue flame. In the periodic table, sulfur is located in group 16 (formerly group 6A), between oxygen and selenium. It is thus a member of the oxygen family of elements, also called the chalcogens. In addition, it lies between phosphorus and chlorine in period 3. Elemental sulfur is odorless, as noted above. The common belief that it smells like rotten eggs is actually an association with the smell of hydrogen sulfide (H2S) gas. 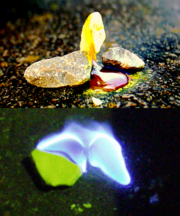 When it burns, sulfur produces a blue flame and emits sulfur dioxide—a gas that is notable for its peculiar, suffocating odor, like that of burnt matches. Sulfur is insoluble in water but soluble in carbon disulfide and, to a lesser extent, in other organic solvents such as benzene. Sulfur can combine with other elements in different proportions, and it is therefore described as being multivalent. Common oxidation states of sulfur include −2, +2, +4 and +6. In combination with metals and oxygen, it forms sulfides (such as sodium sulfide, Na2S), sulfates (such as copper sulfate, CuSO4), and sulfites (such as sodium sulfite, Na2SO3). It also forms hydrogen sulfide (H2S)—a colorless, flammable, toxic gas that is responsible for the odor of rotten eggs—and carbon disulfide (CS2), a colorless liquid with a pleasant smell. In the solid state, sulfur ordinarily exists as cyclic, crown-shaped S8 molecules. In addition, it has many allotropes. Removing one atom from the crown gives S7, which is responsible for sulfur's distinctive yellow color. Many other rings have been prepared, including S12 and S18. By contrast, its lighter neighbor, oxygen, exists in only two significant allotropic states: O2 and O3. Selenium, the heavier analog of sulfur, can form rings but is more often found as a polymer chain. Depending on the specific conditions, the sulfur allotropes form several distinct crystal structures, of which rhombic and monoclinic S8 are best known. The structure of the S8 molecule. Two of the S atoms in this structure lie in the back and cannot be seen. The viscosity of molten sulfur, unlike that of most other liquids, increases with temperature because of the formation of polymer chains. Once a specific temperature is reached, the viscosity starts dropping because there is enough energy to break the chains. Amorphous or "plastic" sulfur can be produced through the rapid cooling of molten sulfur. Studies using a technique known as X-ray crystallography show that the amorphous form may have a helical structure, with eight atoms per turn. At room temperature, this form is metastable and gradually reverts back to the crystalline state. This process happens within a matter of hours to days but can be speeded up by using a catalyst. Sulfur has 18 isotopes, of which four are stable: 32S (95.02 percent), 33S (0.75 percent), 34S (4.21 percent), and 36S (0.02 percent). The radioactive isotope 35S is formed from cosmic ray spallation of 40Ar in the atmosphere. It has a half-life of 87 days. The other radioactive isotopes of sulfur are all short lived. Sulfur with a distinctive isotopic composition has been used to identify pollution sources, and enriched sulfur has been added as a tracer in hydrologic studies. Differences in the natural abundances can also be used in systems where there is sufficient variation in the 34S of ecosystem components. Sulfur and its compounds have many uses. Its main derivative is sulfuric acid (H2SO4), through which sulfur ranks as one of the most important industrial raw materials. The consumption of sulfuric acid has been regarded as one of the best indices of a nation's industrial development. More sulfuric acid is produced in the United States every year than any other industrial chemical. Sulfur is also used in batteries, detergents, the vulcanization of rubber, fungicides, and the manufacture of phosphate fertilizers. Sulfites are used to bleach paper and as preservatives in wine and dried fruit. Given its flammable nature, sulfur also finds use in matches, gunpowder, and fireworks. Sodium and ammonium thiosulfates are used as photographic fixing agents. Magnesium sulfate, better known as Epsom salts, can be used as a laxative, a bath additive, an exfoliant, or a magnesium supplement for plants. Sulfur is used as the light-generating medium in the rare lighting fixtures known as sulfur lamps. The amino acids cysteine and methionine contain sulfur, as do all peptides and proteins that contain these amino acids. In protein assembly and structure, bonds between sulfur atoms—known as "disulfide bonds"—play an important role. Thus, sulfur is a necessary component of all living cells. Some forms of bacteria use hydrogen sulfide (H2S) in place of water as the electron donor in a primitive, photosynthesis-like process. Sulfur is absorbed by plants via the roots from soil as the sulfate ion and reduced to sulfide before being incorporated into cysteine and other organic sulfur compounds—a process called sulfur assimilation. Inorganic sulfur forms a part of iron-sulfur clusters, and sulfur is the bridging ligand in the CuA site of the enzyme cytochrome c oxidase. Sulfur is also an important component of coenzyme A. The amino acids homocysteine and taurine also contain sulfur, but they are not part of the primary structure of proteins. The burning of coal and petroleum by industry and power plants liberates huge amounts of sulfur dioxide (SO2), which reacts with atmospheric water and oxygen to produce sulfuric acid. This acid is a component of acid rain, which causes soil and freshwater bodies to become acidic, thereby harming the natural environment. It also causes substantial damage to statues and architecture. Fuel standards increasingly require sulfur to be extracted from fossil fuels, to prevent the formation of acid rain. This extracted sulfur is then refined and represents a large portion of sulfur production. Hydrogen sulfide has the characteristic smell of rotten eggs. When dissolved in water, it is acidic and will react with metals to form metal sulfides. Sulfides are a complex family of compounds usually composed of metal cations bound to S2− anions. Natural metal sulfides are common. Iron sulfide, for instance, occurs as the mineral called pyrite—the so-called fool's gold. Interestingly, pyrite can show semiconductor properties. Galena, a naturally occurring lead sulfide, was the first semiconductor discovered, and was used as a signal rectifier in the "cat's whiskers" of early crystal radios. Phosphorus sulfides are important in the synthesis of certain organic substances. For example, P4S10 and its derivatives are used to replace oxygen in some organic molecules with sulfur. Sulfites (containing the anion SO32−) are salts of sulfurous acid (H2SO3), which is generated by dissolving SO2 in water. Sulfurous acid and its corresponding sulfites are fairly strong reducing agents. Other compounds derived from SO2 include the pyrosulfite or metabisulfite ion (S2O52−). Sulfates (containing the anion SO42−) are salts of sulfuric acid. This acid can react with SO3 to form pyrosulfuric acid (H2S2O7). Thiosulfates (containing the anion S2O32−) are sometimes referred to as thiosulfites or hyposulfites ("HYPO"). They are used in photographic fixing as reducing agents. Ammonium thiosulfate is being investigated as a replacement for cyanide in leaching gold. Polythionic acids have the formula H2SnO6, where n can range from 3 to 80. Peroxymonosulfuric acid (H2SO5) is made by the action of SO3 on concentrated hydrogen peroxide (H2O2); and peroxydisulfuric acid (H2S2O8) is made by the action of sulfuric acid (H2SO4) on concentrated H2O2. Sodium polysulfides have the formula Na2Sx. Sulfur hexafluoride (SF6) is a dense gas at ambient conditions and is used as an unreactive, nontoxic propellant. Sulfur nitrides are chain and cyclic compounds containing only sulfur and nitrogen. Tetrasulfur tetranitride (S4N4) is an example. Polymeric sulfur nitride, which can be made from tetrasulfur tetranitride, has metallic properties although it does not contain any metal atoms. It also has unusual electrical and optical properties. Thiocyanates contain the SCN− group. Oxidation of thiocyanate gives thiocyanogen ((SCN)2), with the structure NCS-SCN. Thioethers have the form R-S-R′. These compounds are structurally similar to ethers, which contain O atoms instead of S atoms. Sulfonium ions have the formula RR'S-'R," that is, where three groups are attached to the cationic sulfur center. Dimethylsulfoniopropionate (DMSP; (CH3)2S+CH2CH2COO−) is a sulfonium ion that is important in the marine organic sulfur cycle. Thiols, also known as mercaptans, have the form R-SH. These are the sulfur equivalents of alcohols (which have O atoms instead of S atoms). methyl and ethyl mercaptans are used to scent natural gas so that leaks are readily detectable. Grapefruit mercaptan is responsible for the characteristic scent of grapefruit. Thiolate ions have the form R-S-. These anions are produced by treatment of thiols with a base. Sulfoxides have the form R-S(=O)-R′. A common sulfoxide is dimethyl sulfoxide (DMSO). Carbon disulfide, carbon oxysulfide, hydrogen sulfide, and sulfur dioxide should all be handled with care. Sulfur dioxide is sufficiently safe to be used as a food additive in small amounts, but at high concentrations it reacts with moisture to form sulfurous acid. This acid, in sufficient quantities, may harm biological tissue, including the lungs and eyes. In creatures without lungs, such as insects and plants, it prevents respiration. Hydrogen sulfide is quite toxic—more toxic than cyanide. Although very pungent at first, it quickly deadens the sense of smell, so potential victims may be unaware of its presence until it is too late. Sulfur Chemistry Division, Los Alamos National Laboratory. Retrieved August 11, 2007. Steudel, R., ed. 2003. "Elemental Sulfur and Sulfur-Rich Compounds" (part I & II). Topics in Current Chemistry 230 & 231. Berlin: Springer.